Completed in 1989 to coincide with the bicentennial of Le Revolution it is perfectly aligned with the Arc De Tromphe and the other great monuments of Paris - completing the Axe Historique. It was designed as a monument to humanity and I was surprised to see that underneath it sat a lot of humanity. This photo was taken in 1999. 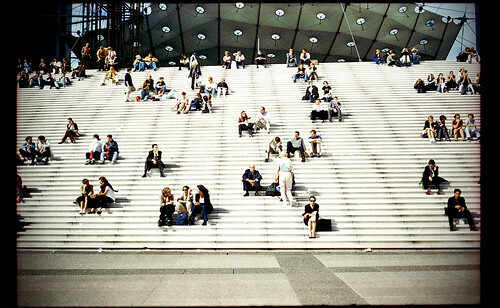 All the people in the photograph are engaged with each other or their surroundings. They either hold eye contact with each other or some distant point on the horizon. No one is looking at the palm of their hand. I’m planning to go back - I have the feeling more people will be sitting alone, looking at the palm of their hand feeling more connected to something or somebody not present. I’ve always liked this photo, mostly because of where it was taken but more because it’s does remind me of a time when people were offline but yet more connected.